Notch is working on a colorful new map system for Minecraft version 1.6. Minecraft was recently updated to version 1.5, adding weather, achievements, rails, and stat tracking, but creator Markus "Notch" Persson is already hard at work on version 1.6. While he calls 1.6 "mostly a bug fix update," it will add a map system, which Persson has revealed the first details and screenshots for. Players will craft maps at a certain zoom level that are centered at the location of their creation. 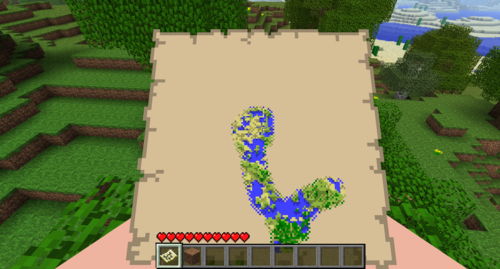 As players move around, the map will fill in. Each map will only represent a certain area depending on where players are in the world, so we'll only be able to create maps of the entire world if the zoom level allows for it. Maps are items that can be dropped and picked up by other players, who can also view them. Notch says there'll be a map linking system so that multiple players can fill out the same map and see where each other are. 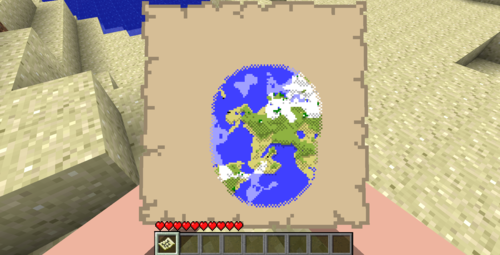 If the world is changed, as Minecraft worlds tend to be, players will have to visit the changed location to update the map. It sounds like Notch is still working out the map system's kinks and figuring out its final feature set. Interestingly, he adds that the code written for it will probably be reused later for player-created books, notes, or even paintings. The map system will be the only new feature in 1.6, so other interesting additions such as these may have to wait until 1.7 or beyond.